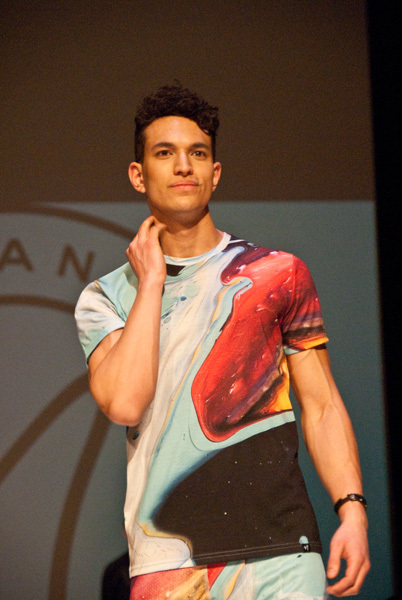 Fashion Art Toronto (FAT) is the fusion of art and fashion during a weeklong multi-arts event in Toronto running on April 12-16. Every day is packed with a mix up of runway shows, live performances, fashion films, art installations and photography exhibits. This year’s theme - Dress Codes, focuses on how fashion is used to construct a person’s identity. Everyday of the week each collection focuses on a sub-theme of the day. Friday's theme, Counter CODE, focused on the rejection of mainstream styles and is instead collections that are inspired by rebellion and evolution. 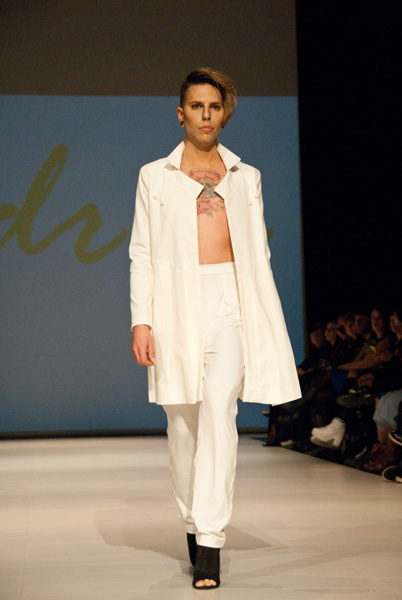 The first runway show of the night on April 15 was Wolf N Crane, a streetwear brand, by Ena Luckin. Inspired by Toronto streetwear, she showcased dresses, shirts, pants, rompers, leggings, shorts, and mini-capes in her featured line. Many of the designs included graphic prints of knives, roses, Hemp leaves and cranes.The colour palette of the pieces remained on the dark side, with mainly blacks and whites used as her bases with only minimal color added. 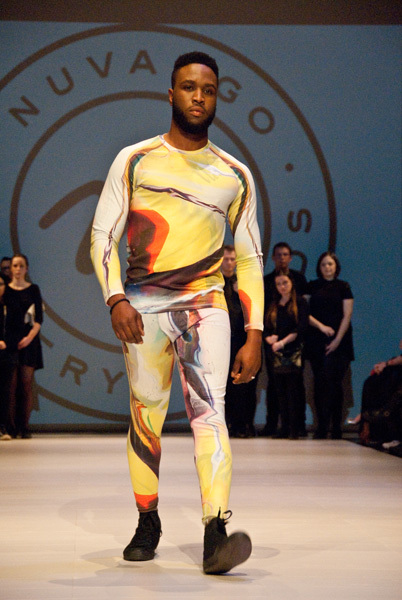 The second runway collection was created by Lex Brown showcasing her pieces from her company - Neoteny Apparel. Her collection -[Fallacy] Transitional focused on dress codes within non-creative work places. The pieces combined both modern business professional attireand the colourful prints, and cuts of fashion’s latest designs. Though the pieces stood out in their own way, there is still a conservative aspect and design to the pieces that make them office appropriate. In the third runway show, House of Poplyn, featured many of its designs around layers of tulle and tie-dye for its theme - Dreamcatcher. Tanushree Pande, House of Poplyn’s founder, managed to embody the feminine charm and youthfulness within her pieces. The designs were a combination of both evening looks and dramatic ready to wear items. The overall colour palette remained on the fair side, with a mix up of whites, pale greens and baby blues, said to be inspired by the colours and patterns of nature. Andrea JungMin Oh’s featured theme for her collection was Dressing Line, which improved the ideas from paper dolls and technical drawings. Mainly a womenswear designer, Oh’s pieces stuck to only one colour, white, throughout her entire line. The pieces were beautifully versatile and designed in such a way that the items could be worn either as evening wear or as business attire. The founders Pichora and Downs of Nuvango, joined together with Fashion designer, Hillary Sampliner, to present Sampliner’s collection called Colour Theory, which explores art in motion and the body as the canvas. The designs on the collection were created from works on canvas or on a computer screen. They encompassed a wide range of designs from pops of colors to loud and eye-catching pieces that are both bold and wearable. Ross Wirtanen is the director and choreographer of the performance-art piece called SKULPTUR. The runway transformed with the setup and execution of this piece, which was inspired by greek mythology. Padina Bondar focused her collections around the biology of the female reproductive system. Each piece represented the different stages and a specific period in a woman’s life. The pieces displayed both modern and retro feel to their designs. Despite being wearable art projects, some of the designs could be considered evening wear with the chic and elegant designs, which present the female form for what it is.